HERRAMIENTAS DE MEDICIÓN DE FONDO DE POZO. servicio. La línea de productos se completa con la asistencia técnica, calibración y mantenimiento de los equipos. 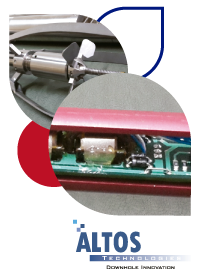 ALTOS TECHNOLOGIES is an argentinian company that designs and manufactures a whole range of downhole logging systems. On its portfolio, there are sapphire and quartz memory gauges, PLT and north seeking gyros. Its equipment can be run on any wireline or slickline truck or be conveyed with tubing, drill pipe or coiled tubing. The company provides a complete solution from downhole tools to the surface telemetry panel and acquisition software that allows the clients to provide high quality services. To close the full circle, the company has development, manufacturing and maintenance and technical aid for its equipment.